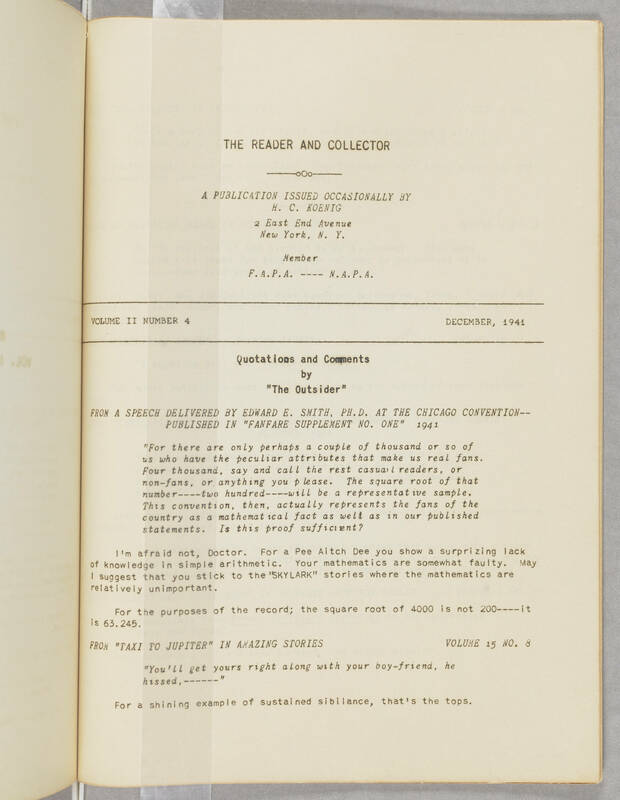 THE READER AND COLLECTOR A PUBLICATION ISSUED OCCASIONALLY BY H. C. KOENIG 2 East End Avenue New York, N. Y. Member F.A.P.A. ---- N.A.P.A. VOLUME 2 NUMBER 4 DECEMBER, 1941 Quotations and Comments by "The Outsider" FROM A SPEECH DELIVERED BY EDWARD E. SMITH. PH.D. AT THE CHICAGO CONVENTION-- PUBLISHED IN "FANFARE SUPPLEMENT NO. ONE" 1941 "For there are only perhaps a couple of thousand or so of us who have the peculiar attributes that make us real fans. Four thousand, say and call the rest casual readers, or non-fans, or anything you please. The square root of that number----two hundred----will be a representative sample. This convention, then, actually represents the fan of the country as a mathematical fact as well as in our published statements. Is this proof sufficient? I'm afraid not, Doctor. For a Pee Aitch Dee you show a surprising lack of knowledge in simple arithmetic. Your mathematics are somewhat faulty. May I suggest that you stick to the "SKYLARK" stories where the mathematics are relatively unimportant. For the purposes of the record; the square root of 4000 is not 200----it is 63.245. FROM "TAXI TO JUPITER" IN AMAZING STORIES Volume 15 NO. 8 "You'll get yours right along with your boy-friend, he hissed, ------" For a shining example of sustained sibilance , that's the tops.